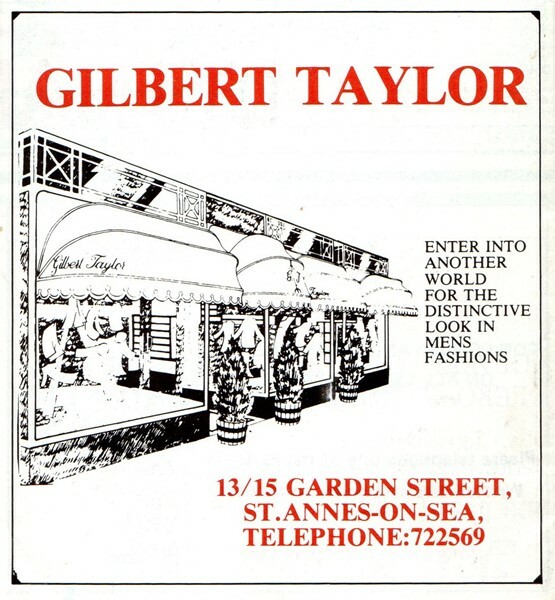 Gilbert Taylor, Outfitters, St Annes. Gilbert Taylor, Garden Street, St Annes. St George's Lane (the back street) crosses here. no.13 Harold Leake & Co., electrician. St George's Road crosses here. Halifax Building Society in 1923, opposite the entrance to Ashton Gardens; Gilbert Taylor's was one of the new shops to the left. 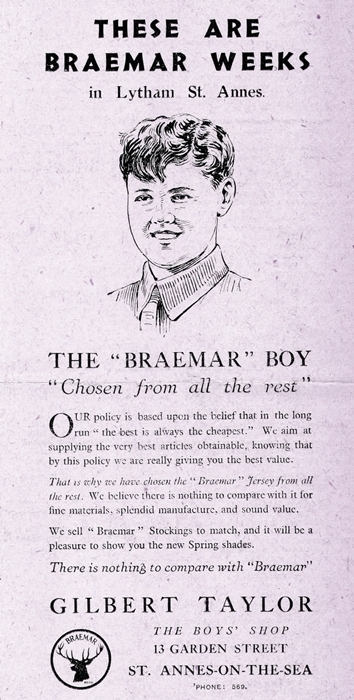 Advert for Gilbert Taylor, 1929. Gilbert Taylor (complete juvenile and schoolboys outfitter) is listed at 17 Garden Street in 1924 and 13 Garden Street in the above advert from 1929. 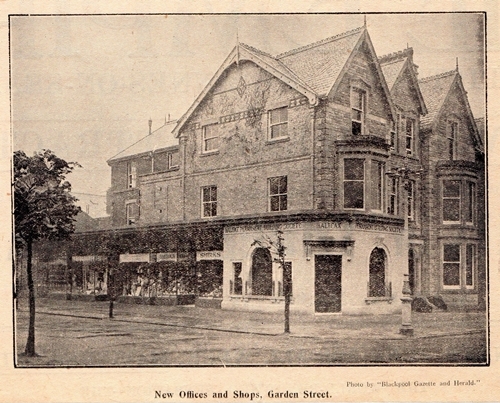 By1938 the shop had expanded and to nos.13-15 Garden Street. Advert for Gilbert Taylor, c1980s. By the 1980s1. the shop had changed from being a schoolboys' outfitter to a mens' outfitter. After eighty years of trading the shop closed c2004-5. About 2011-2 the shop was Coco & Tom's designer outfitters and in 2014 "Mooch 1" Home Interiors Shop & Café. 1. Gilbert Taylor (Outfitters) Limited was incorporated on 07 Feb 1969.